A little while back we did a post about Chris Shiflett (of the Foo Fighters) and his board. On that particular post, we were unclear about a pedal, which was later identified as the Heptode Virtuoso phaser. From that post, we’ve been in contact with Jean-Luc of Heptode Effects and he was incredibly generous by letting us give one away to you! The Heptode Virtuoso is based on the original Maestro PS-1A Phase Shifter which was made famous by John Paul Jones, Steve Howe, Ernie Isley and of course.. Chris Shiflett. Can’t get the original, this is the next best thing! The unit basically has 3 switches for the 3 modes – Slow Phase, Medium Phase and Fast Phase. Compared to the original, this is much smaller to accommodate today’s pedal boards. There are internal trim pots to adjust the JFET bias and effect depth – but according to Heptode, adjusting these pots is strongly discouraged, but available for the bold. The Heptode Virtuoso usually retails for $300, so this is an extremely great opportunity get a fantastic pedal. Do NOT miss out on this! We’d like to extend a special “thank you” to Jean-Luc of Heptode Effects – please take a moment to check out their web site, like them on Facebook and follow them on Twitter! It’s simple really. All you have to do is participate in the site; leave a pedal review and/or submit a new pedal. Every time you take one of these actions, you will receive an entry into the giveaway. Submit 2 reviews and add 5 pedals and you’ll get 7 entries. You get the picture. 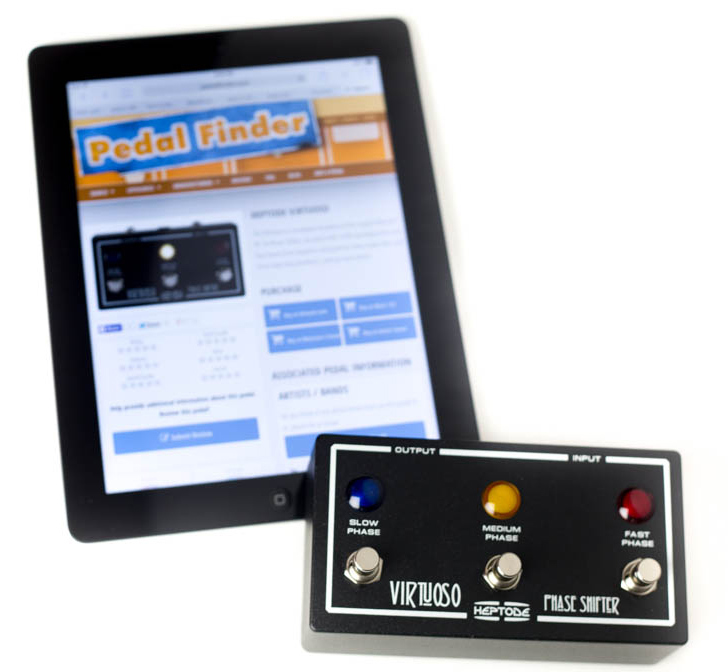 There is no limit to the number of times you can enter, so stop on by Pedal Finder and leave a review on your favorite pedal. Also, these past entries and efforts on the site will continue to count for this give away! So use this time to build up your entries. Your entries can be viewed in your profile.. so be sure to become a member first!! This current give away will be open until 2PM MST December 19th – just in time to get this before Christmas! More information about the giveaway can be found on our Giveaway page. This pedal sounds fantastic in the videos. Truly a work of art. I’ve been obsessing over the sounds in this thing. Surely it will be only a matter of time before I’ve convinced my wife it’s an absolute essential. They’re not easy to find new, and so far have been impossible to find used. Nevertheless, one day it will be mine.